Audi has completely updated every panel of the A4 sedan for 2017, though you’d be hard pressed to notice any changes at all. The biggest change you will notice is a hike in the price, with the base A4 now starting at $37,300 before destination fees. That destination fee is worth $950 dollars, and that $37,300 asking price on the FWD Premium trim is up from the $35,900 price tag of the outgoing A4. The 2017 A4 Quattro will start at $39,400 before destination fee. Audi backs up the jump in price with a lot of value in now-standard features, including keyless start/stop, Audi’s smartphone interface, a rear view camera, 3-zone climate control, and Audi’s pre-sense city technology, which uses a front facing camera on the windshield to scan the road for obstacles and pedestrians, warning the driver and stopping the car to avoid an accident. That’s quite a bit of kit for $1,400. The new A4 will show up this Spring offering a 2.0 liter turbocharged four-cylinder with 252 hp and 273 lb-ft of torque, and the range will expand later on with a lower entry-level 2.0 liter engine and, according to Audi, a new 2.0 liter diesel option. Then, of course, the Audi S4 will go on sale with a 3.0 liter turbocharged good for 349 hp and 368 lb-ft, with a claimed 0 to 60 time of 4.7 seconds. 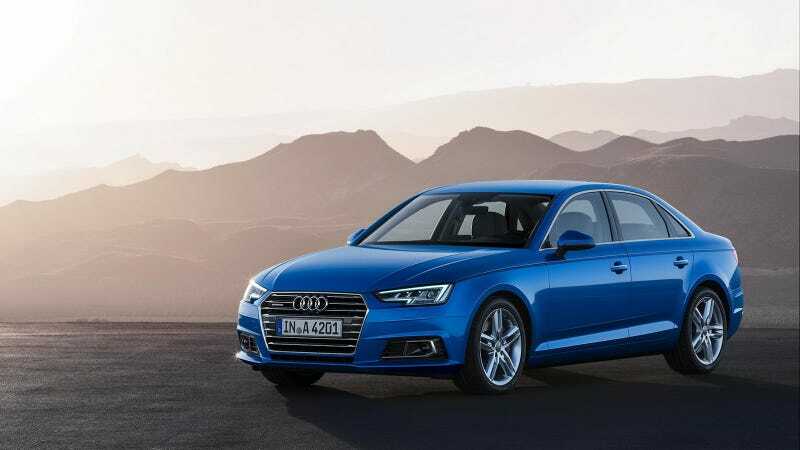 The A4 will be equipped with a 7-speed dual-clutch transmission, while the new S4 drops the dual-clutch for a new eight-speed tiptronic transmission. You can read more about the differences between the outgoing and incoming S4 here. Is that slight crease in the headlights enough to sell you on a new A4/S4? Or how about all that new fancy technology? I know what you’re thinking.. you want a wagon. You get your hopes up only to get what you know is (or isn’t) coming. Sorry, America. Automakers don’t trust you with all that extra cargo space. We’ll see the new A4 up close at next week’s very cold Detroit Auto Show.